Board member Kathy Lennon, left, listens to schools superintendent Bryan Johnson discuss a state partnership zone for low performing schools during a meeting of the Hamilton County Board of Education on Thursday, Sept. 21, 2017, in Chattanooga, Tenn.
With the beginning of the new school year in Hamilton County last week came the launch of one of the district's most prized new initiatives — the Future Ready Institutes. As of Monday, 1,288 high school students had signed up for one of the 20 institutes embedded in traditional high schools across the county. 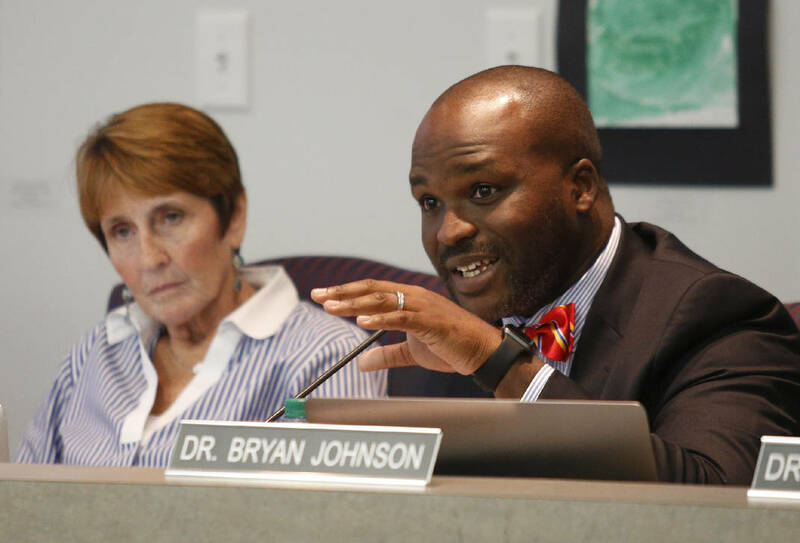 Despite Hamilton County Schools leaders' and board members' assertions that the institutes will help increase diversity by allowing students not zoned for those schools to attend an institute, only about 70 students — some 5 percent — are enrolled out of zone. The catch? Getting them there. "In a perfect world you are able to provide transportation to all students," said Superintendent Bryan Johnson. "You also understand there are budgetary challenges." Johnson emphasized that 70 students attending institutes out of their zones is an encouraging sign, and those numbers might increase as registration is finalized when the first few weeks of school wrap up. Getting students to the institutes was always going to be a challenge, officials said. "That is what we have to work on. Unfortunately, we don't have the dollars to do that this year," said board member Kathy Lennon, of District 2, of transportation to the institutes. "The first step is having the Future Ready Institutes and have the opportunities for the students." The institutes, which were announced in March, are small learning academies focused on industry themes such as aviation, computer science, forensics and health care. They combine core, required courses such as English and math with career and technical education courses and provide externships and work-based learning experiences to the cohorts of students that attend them. A hallmark of the initiative, emphasized by the district, partners and school board members, has been that it will enhance opportunities and increase equity for students. Johnson, who visited East Ridge High School's Institute of Building and Design Monday, said students in the construction classes were focused and excited. "Going into those classrooms, you know students are there," he said. "The level of excitement and engagement is because students are there because 'It's what I'm interested in.'" East Ridge's institute is one of the four most popular institutes, with more than 100 students enrolled. The Howard Schools' Erlanger Institute for Health care and Innovation, Hixson High's Institute of Health Careers and Medical Advancement, Ooltewah High's Institute of International Baccalaureate Studies and Signal Mountain Middle/High School's Institute of International Baccalaureate Studies also all have more than 100 students enrolled. Board member Joe Smith, of District 3, said the district was close to its target goal for the institutes. When the plan was announced, institutes were estimated to accommodate up to 100 students each. Smith did say he was surprised that more students from other schools were not enrolled out of zone. "You have to dive into why that is. Are they [students] not going to an institute out of zone because they can't get there? That's a question," he said. "That surprises me a little bit that we don't have more that's making that choice to go to a particular institute." Lennon said providing transportation to increase accessibility to the institutes would be a priority for the district in year two for the institutes. "Hopefully that will be in the budget for next year," she said. "I think we need to provide those opportunities for our students. I think it's going to be really hard because we have a lot of needs in the district." However, the district already spends millions of dollars a year transporting students, and board member Rhonda Thurman, of District 1, has long been a proponent of not providing busing to students who attend schools, such as magnet schools or the Future Ready Institutes, outside of their zoned schools. "We cannot provide everything in every school," she said. Thurman said she felt kids would be better served if vocational training programs such as the career and technical education aspects of the institutes were all housed in one place, similar to how Sequoyah High School used to function. Regardless of how students arrive at the institutes, teachers, coaches and administrators are excited to launch the programs this year. "We feel we have the greatest opportunity to affect student life," said Glenn Perry, assistant principal at Brainerd High School. "The Future Ready Institute is an engaging hook to engage with student[s]." Perry said he and his staff at Brainerd were getting themselves and their students ready for the year. "Working this puzzle, the Future Ready Institute is a big piece," he said. "And how does that fit into the larger puzzle of career and workforce readiness?" Though several students were not able to attend Brainerd's first responders and forensic and aviation institutes because of a lack of transportation, according to Perry, one student from outside Brainerd's zone is attending the school this year.